ASUNCION, Paraguay (AP) — South America's soccer governing body CONMEBOL has refused an offer from the U.S. Soccer Federation to organize and host a continental competition in 2020. MEXICO CITY (AP) — The man suspected of shooting former Paraguay national soccer team standout Salvador Cabanas in the head in 2010, effectively ending his career, has been sentenced to 20 years in prison in Mexico, authorities announced Sunday. ASUNCION, Paraguay (AP) — Authorities in Paraguay say they have seized more than two tons of cocaine in the country's north in the biggest seizure of the drug in the South American nation's history. National Anti-drug Secretariat spokesman Francisco Ayala said Thursday that the 2,199-kilogram cargo was found at a ranch in a small town about 250 miles (400 kilometers) north of the capital, Asuncion. ASUNCION, Paraguay (AP) — The leader of the Brazilian criminal organization Pure Third Command has been captured in Paraguay's capital and will be expelled from the country. ASUNCION, Paraguay (AP) — Still only 14 years old, Fernando Ovelar scored his first goal for Cerro Porteno one week after becoming the youngest to ever play for the Paraguayan club. Ovelar scored in the 15th minute of Sunday's 2-2 draw against Cerro Porteno's biggest rival, Olimpia. The midfielder calmly knocked the ball over goalkeeper Alfredo Aguilar for the opening goal. TAOYUAN, Taiwan (AP) — Taiwanese President Tsai Ing-wen hosted her Paraguayan counterpart Tuesday at a military exercise in a sign of the island's determination to withstand China's diplomatic onslaught. The joint land and air training exercise simulated an attempt by Chinese forces to attack a Taiwanese air base in the north of the island. SAO PAULO (AP) — Brazilian police arrested a fugitive Friday who is alleged by U.S. authorities to be Hezbollah's financier and who has repeatedly been accused of illegal activity in a lawless border area where three South American nations meet. ASUNCION, Paraguay (AP) — Three Paraguayan judges who gave a Roman Catholic priest convicted of abusing a 14-year-old a minor sentence have been suspended, authorities said Wednesday. ASUNCION, Paraguay (AP) — Paraguay hired former Mexico coach Juan Carlos Osorio to lead its own national team on Monday. NEW YORK (AP) — A former top South American soccer official was sentenced on Wednesday to nine years in prison for pocketing millions of dollars in cash bribes as part of the sprawling FIFA corruption scandal. FIFA said officials decided Tuesday to appoint a "normalization committee" that will run the federation, known as AUF, until Feb. 28, 2019. Former Argentine President Cristina Fernandez denied new corruption allegations aimed at her, while she refused to answer an investigative judge's questions about in case in which she is purported to have led a corruption scheme involving government officials and business leaders. ASUNCION, Paraguay (AP) — Mario Abdo Benitez took over as Paraguay's new president on Wednesday, replacing a seemingly disgruntled Horacio Cartes, who left the inauguration ceremony before it finished. ASUNCION, Paraguay (AP) — The final matches of South America's top club tournaments will be one game starting in 2019. The region's football body Conmebol said Tuesday the finals of Copa Libertadores and Copa Sudamericana will have a host city next year, and not home-and-away games between finalists. The last game of the 2019 edition of Copa Libertadores will be played in Santiago, while the Copa Sudamericana will be decided in Lima. BEIJING (AP) — When Taiwanese President Tsai Ing-wen departs Sunday for Latin America, she'll be traveling to a region she's already visited three times in two years. ASUNCION, Paraguay (AP) — The Paraguayan government expressed "discomfort" Monday over a tweet by Britain's ambassador that reacted to the acquittal of peasants convicted in the killing of police officers in a land dispute. The Supreme Court overturned the 2016 conviction of the 12 poor farmers Friday citing a lack of evidence. Six police officers and 11 peasants were killed in 2012 when clashes broke out during the forced eviction of peasants occupying a disputed soy farm. ASUNCION, Paraguay (AP) — Paraguay's President Horacio Cartes said Tuesday he was withdrawing his resignation, signaling at least temporary defeat in his effort to take a full Senate seat and extend his influence — and perhaps legal protections — after his term ends in August. ASUNCION, Paraguay (AP) — Paraguay's President Horacio Cartes on Wednesday suffered at least a temporary a setback in his effort to take up a Senate seat once his term ends after his opponents boycotted a congressional session on his resignation. Cartes' five-year term ends in August and Paraguay's constitution says former presidents automatically become senators for life, with a voice but without a vote. Sudden death is used in an array of sports to determine the outcome of a match when the score is tied. Soccer decided to embrace the concept in the mid-1990s, and FIFA sanctioned its use in the World Cup for the first time in France in 1998. The hope was that the "golden goal" — the linguistically more positive term used in soccer — would promote attacking play and reduce the likelihood of a penalty shootout, which many in the game considered to be an unfair way of deciding matches. JERUSALEM (AP) — Paraguay opened its new embassy in Jerusalem on Monday, following in the footsteps of the United States and Guatemala. ASUNCION, Paraguay (AP) — Paraguayan authorizes have issued an arrest warrant for a man President Horacio Cartes has described as his "soul brother" as part of a sweeping investigation into corruption in Latin America. A financial crimes prosecutor on Wednesday accused the president's friend, Dario Messer, of money laundering and criminal association. The dual Brazilian-Paraguayan citizen has been on the run since Friday, when Brazilian authorities issued an arrest warrant there. ASUNCION, Paraguay (AP) — Paraguay's Foreign Ministry confirmed on Wednesday that the country will shift its embassy in Israel to Jerusalem, following the U.S. and Guatemala in a change long sought by Israel's government but opposed by Palestinians. 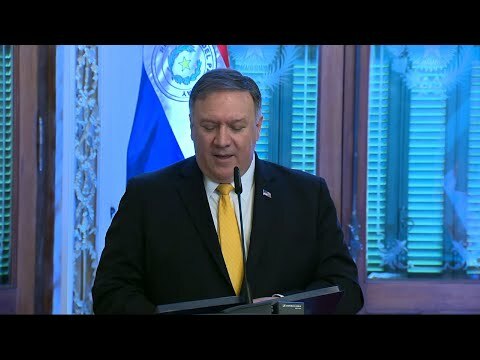 The ministry said in a statement that it "has begun the process" of carrying out the order by President Horacio Cartes.